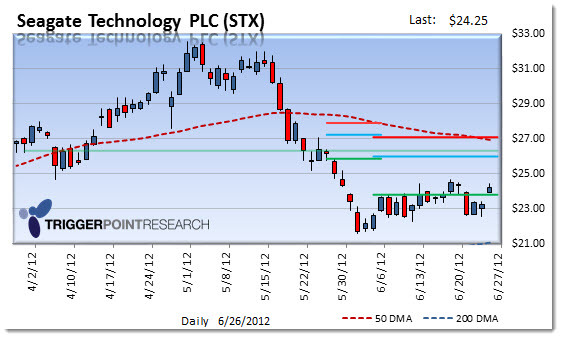 Seagate (STX) shareholders may have something to worry about. The latest read-throughs on hardware sales is disturbing. From Dell (DELL) to HP (HPQ) there is lots of noise coming from management that they have seen the trend in sales declining sharply. Just last week, Lenovo came out with an update that was downright miserable. Now, add to these dour outlooks the fact that there is a push toward solid-state drives as we saw with Apple’s (AAPL) new line of Macbooks, the rise of the tablets and of course the storage available via the cloud and it is no wonder that Seagate (STX) and Western Digital (WDC) were downgraded last week by Barclays. Bloomberg: Barclays downgraded both Seagate (STX) and Western Digital (WDC) to Equal Weight from Overweight given several factors that could keep shares range-bound over the near term. Firm says this call is not really about the current quarter, but certain developments could impact guidance around September and December. The firm feels that PC related news flow. The potential for cloud-based storage is probably the biggest risk here. Think of how the cassette was replaced by the CD and the CD by MP3 technology. The providers of the medium were the big losers and the content providers the winners. If we take the leap and compare disk drive technology to the now extinct 8-track, in the end we get a lot more sales for massive storage that will feed the content via internet enabled devices. While the cost for those storage devices is higher overall, per unit it is much less. Content providers are pushing for greater use of central storage plans as software-as-a-service is becoming an increasingly important component of revenue. Just look at Salesforce (CRM) as a prime example of how local storage has been de-emphasized along with Apple and Microsoft’s (MSFT) cloud initiatives. If the potential for a radical change in the way storage is utilized by the average user is not enough to get noticed immediately, there are technical points that are up for discussion.